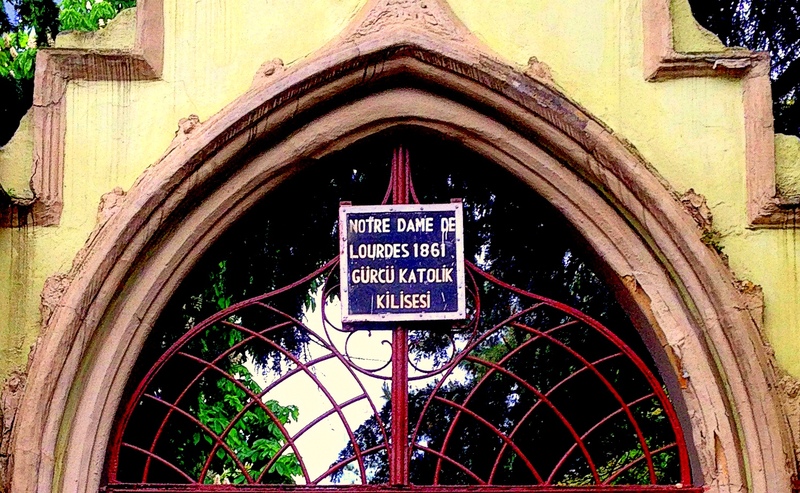 Notre Dame de Lourdes (known in Turkish as the Bomonti Gürcü Katolik Kilisesi) is a Georgian Catholic church in the Feriköy neighborhood of Istanbul. Most Georgians being Orthodox Christians, there are not many Georgian Catholic churches in the world. Further, there were never many Georgians in Istanbul, and there are very few today. Thus the very existence of this church is twice surprising. Its continued use is also surprising. Most sources report that the congregation today is largely made up of Turks, though when I went to see the church I found an amicable group of Georgians inside. The church was built in 1861 and extensively renovated in 1901. For further details on the church, as well as its place within the history of Georgian Catholicism, see this recent paper by Natia Natsvlishvili. It’s a very nice essay, and I don’t have much to add to it, so this post will contain mostly pictures of the church along with some comments.